Hurricane Michael‘s landfall along the Florida Panhandle forced a Tallahassee couple to improvise by getting married inside Jacksonville International Airport last week. According to WCTV, Jim and Lorri Beary were originally planned to tie the knot at a Leon County courthouse on October 10. However, the building was closed due to the threat of Michael. 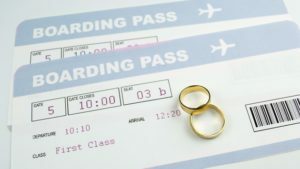 Rather than postpone the wedding, the couple reached out to Selecia Young-Jones, who agreed to officiate at the airport so the couple could wed on the significant date and travel to Europe for their honeymoon as husband and wife. The brief ceremony took place in a public space in front of total strangers. The couple said the unusual ceremony was fitting given that their mutual love of adventure is what brought them together in the first place. The newlyweds will enjoy a 10-day honeymoon in Italy before returning home to celebrate their reception with family and friends.